Adventures in the Andes wrap up! Genevieve Drouin, CFTC’s Program Manager for Bolivia, is back in Canada after a quick but fruitful trip to that country, visiting our local partner IPTK which is expanding their support for parents and children in Sucre. Poverty is a great problem, but motivation and plans for improving the lives of children among parents and IPTK – and with the help of our ever-generous CFTC supporters – is even greater! Feb 13, 2012, La Paz, Bolivia–On day six we were scheduled to return to La Paz for a meeting with the Canadian International Development Agency. Our timing meant that we were dependent on an “on time” flight out of Sucre – risky because the location of Sucre’s airport makes it prone to fog and, as a result, frequent flight delays. I woke up that morning to the sound of rain falling on the patio outside my window and opened the curtains to a thick cloud of fog! A phone call to the airport confirmed that our flight was delayed until further notice. This was a key meeting for us and we were frustrated by the delay. On the upside, it gave me a bit of time to walk around Sucre and take in some of the sights of this beautiful city. It was a worthwhile stroll, even in the rain. 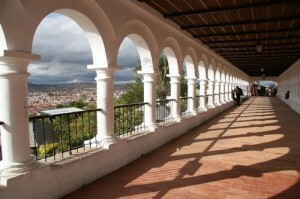 View through the arches of a Colonial Spanish building looking out over Sucre. Sucre is known as the city of four names – La Plata, Characas, Ciudad Blanca and Sucre – reflecting its multi-cultural history. It was designated a World Heritage Site by UNESCO in 1991, specifically because of its well-preserved architecture, which dates back to the early 1600s and which is a blend of local architectural traditions with styles imported from Europe. We eventually decided that it was best to go to the airport and wait it out. If the fog lifted, the planes would need to take advantage of the clear window of weather. About an hour past our planned departure, the fog cleared and we boarded the plane for La Paz. On arrival, we jumped into a taxi and headed straight to the Canadian Embassy. We arrived, according to the clock in the lobby, at 1:29 P.M. for a 1:30 P.M. meeting. Right on time! After a very useful meeting, Fernando Romero (Country Manager), Shirley Estevez (Program Officer) and I headed to the CFTC Bolivia Country Office. We reviewed the past week’s work and all agreed that our time together was very productive. At the end of my first country visit to Bolivia with CFTC, I am leaving with a stronger understanding of the context and challenges faced by low-income families in one of Latin America’s poorest countries. It is clear that we have a lot of work ahead of us to make this project a success. But also clear that we have the partner and commitment in place to be successful! Our local partner, IPTK’s, expertise in early childhood development and its strong relationships with local government and the communities we are working with are crucial assets to this project, as are the strong knowledge and experience of the CFTC Bolivia staff. Over the coming months and years, we plan to work collaboratively with IPTK, local government, and the communities themselves to help unlock the potential of the children and families we visited in these rural Andean communities. I look forward to sharing more on the progress of our work on future visits! 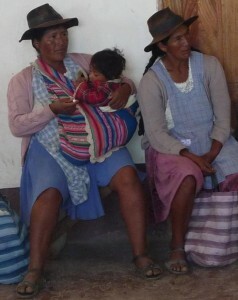 I’ll be returning to Bolivia in April for the launch of our Theory of Change work here. Stay tuned for more on that in the coming months!